The Loake Balmoral Weekend bag is made from smooth and grain leathers and is perfect for a weekend away. Featuring a detachable shoulder strap, full width internal velcro fastened pocket, and single internal zip pocket it’s both stylish and practical. Available in a choice of Light or Dark Brown. The bag would also make a great treat for yourself or a fantastic gift for someone special. We’re offering one lucky person the chance to win one of these Loake Balmoral bags worth £235. Closing Date: Sunday 4 November 2018. Good luck! 1. 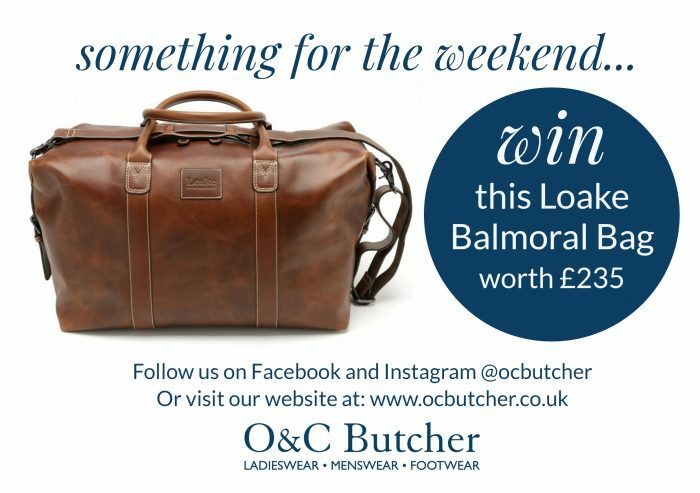 The winner will receive a Loake Balmoral Weekend bag – depending on availability they will be able to choose which colour. 3. This prize draw is not open to employees (or members of their immediate families) of O&C Butcher. 6. The closing date is as specified in each prize draw, and O&C Butcher reserves the right to amend the prize draw end date at any time. 7. If you win a prize draw, we will notify you by e-mail or telephone. If you have entered via Facebook or Instagram then this is how we will contact you if you win. The judges’ decision will be final, and no correspondence will be entered into. 8. The winner of each prize draw will be published on the O&C Butcher Website and social media pages or alternatively email info@ocbutcher.co.uk to request winner names stating for which prize draw. 9. By entering the prize draw the winner agrees to participate in such promotional activity and material as O&C Butcher may require. 13. O&C Butcher will not share your details with any third parties. 15. You have the option to receive enews from O&C Butcher with offers, information and news about the destination by ticking the box above.